Savings and design in lighting led advanced technology in almost every house. Many change ordinary basement lamps for economical LED products. Not everyone knows, how to repair their own LED lamp, especially from what parts it consists in. As a tool to use in case of breakage, to start the whole process. Try to understand in detail, What are the failure in devices and some LED chandelier to repair their own hands. typical failure: partial or complete absence of light, momentary blinking or spontaneous shutdown, failure. The reasons: Above the temperature reached 50 degrees, break contact of the filament itself and the holder, if the paid version, instead of a tube, contacts detachment on board. LED burned, partially or fully. reason: Overvoltage in the network, blown capacitor (breakdown). Typically breakage occurs in cheap boards embodiments. 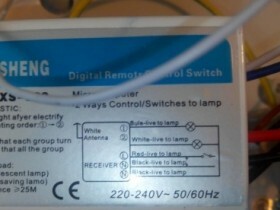 There are additional reasons, resulting in failure of the device, namely: short-circuited, incorrect connection to the network, device failure to the connection circuit when mounting. 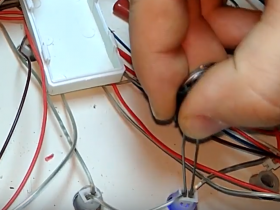 Poor soldering circuit contacts, LEDs to the board, Loose wires in the base of the lamp. 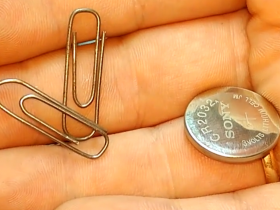 Weak soldering conductive elements (wires, tire). reason: Factory defect. Repair many chandeliers with LED control is carried out for this reason. Before you repair the LED lamp, you must remove the device. It needs some tool; thin screwdriver with flat end, Phillips. If the compound was assembled using twists, will need pliers with insulated handles, masking tape Multimeter, to check the contacts. Tweezers come in handy in working with small details. You need a soldering iron with a fine tip and solder (it is desirable to use a special nozzle). Drill with a drill 2,5 mm., It may also be useful, disconnect the basement of the lamp, Drill out the mounting. Several thin wires on 10 cm., length. Attention! Carry out electrical work without a special tool is prohibited protected! With control chandeliers appeared not so long ago. Few people are familiar with their device. Carrying out repairs LED Ceiling x chandeliers need to know the structure, just in general terms,. We will understand more, from which it can be. Simple LED chandelier consists of a body, controller unit or driver. It is used as a voltage rectifier. It is equipped with terminals, or screw terminals, which is connected to the mains supply. Then, on the block are the wires to the lamps. They may be from a single wire, under normal lamp, to 12 a design variant of the device. Olka blocks, conducting automatic adjustment. The raster fixtures can be several different types of drivers and LED elements, lamps. On the specific type of lighting instrument depends inspection and repair of components. the lighting element, lamp. Here we need the very scheme of LED lamps. Repair LED lamps operate without remote carried out easier. It is no big deal, gathered by one type of: one or more diodes (possible compact bridge), electrolytes (capacitors), a pair of resistors (resistors), and coil winding. This is a simple circuit without protection, there are plenty of options for, but we are Let us examine just a simple scheme. 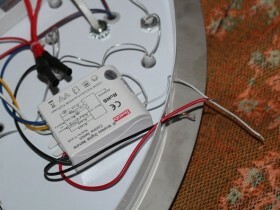 removing the lamp, check fee of the presence of visible defects, wire breakage, about tsutstvie such a good sign. Remove the cover or decoration around the lamp, remove the lighting elements. Examine the pedestal, burnt place say about bad contact. If they are, try to clean them with a knife. repackage terminals, or twisting, Tighten the screws on all items. Finding no visible defects, We proceed to the inspection lamp. Option Block Lamp, where relays and lamps are side by side on a large board, treated as described below repair lamp. 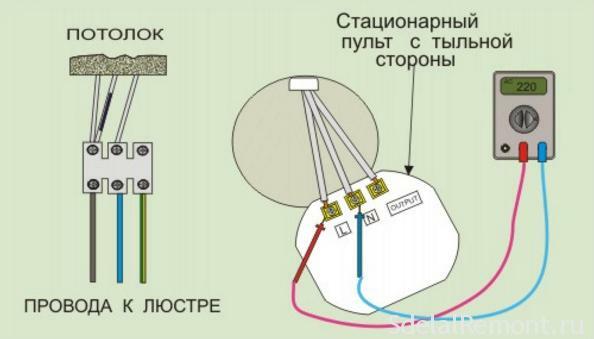 Repair LED lamps with your hands start with the definition of the place of breakage or failure. Please try to parse the lamp itself. There collapsible models but sometimes need a hairdryer to heat the building or trimmed body. Вначале естественно визуальный осмотр. Usually, сгоревший светодиод отличается по цвету или имеет подгоревшую ножку и контактные площадки для пайки светодиода обгорели или отслоились. Energize better separate power supply, the lamp. Usually 3.7 volt is supplied to each LED, but there are other denominations m. It is necessary to pay attention to that, depending on the number of LEDs and voltage changes. Для быстрой проверки светодиодных элементов лед лампы подручными способами можно использовать любую батарейку на 3 volts and clips connecting contacts. Just observe polarity. Such an apparatus and test use when checking the built-in light fixture. The failure of one LED, entails the shutdown of all! alternately close (throw jumper) contacts each LED with tweezers or wire stripped and tinned contacts. The lamp lights up when, when you find (loop ends contact) LED on the burned. If this does not happen, See below for the chain. Check the charge on the cause burnouts, swelling of capacitors, carefully check the tracks on the motherboard controller. Ragged solder contacts. 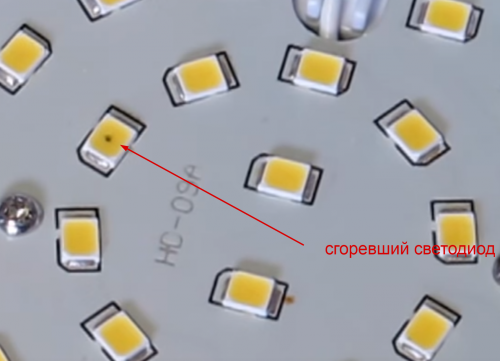 It is impossible to replace the LED jumper, when in their less common circuit 10, there will be an overload of capacitors, block LEDs, sgoryat, when one of their body 3 PC. Determine their possible in three dark spots, in yellow or white crystal. It is important to know that, светодиод имеют полярность и при его замене нужно правильно его установить на плату. All LEDs are soldered printed by, that is immersed in a tin. Usually, для запайки светодиода используют паяльный фен. At home, though difficult, but it is possible to apply the soldering iron tin More. Для установки достаточно установить его на печатную плату и прогреть паяльником его торцы с контактными площадками. When a powerful soldering have further warm up from the bottom board soldering. It is important not to overheat when soldering the LED element! 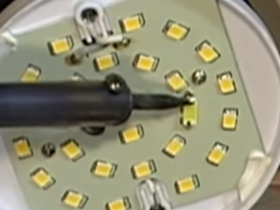 A possible way to repair LED lamps using conductive paste. Video: Ремонт светодиодных ламп “Космос” без паяльника. Easy. The usual scheme of low-cost Chinese lamp 220 volt. Instead, a reliable driver in them collected a simple circuit transformerless power supply capacitors, and rectifiers. Mains voltage is first reduced nonpolar capacitor METALLIZED, straightens, and then smoothed and increased to the desired level. The load current is limited to conventional SMD resistor, which is located on the PCB with LEDs. In the diagnosis and repair of the LED lamps of this type it is important to observe safety precautions, tk. All circuit elements are potentially high voltage. By touching a finger to the live parts through negligence scheme can get an electric shock, and slipped multimeter probe may be short-circuited wires with unpleasant consequences. LED chandeliers often repair to be done due to overheating of the matrix itself. First fastening unscrewed and visually inspect the inside of the chandelier. Then try to move the board carefully, on the spot. determine the, whether wire breakage from the control unit, I do not carried overvoltage otgorel. Esslin top, soldered into place. Check one by one all the details. Then you will need the original chandeliers scheme. Without it, you can only carry out repairs chandeliers without remote control. If there is a remote control unit, change the batteries in it new elements. 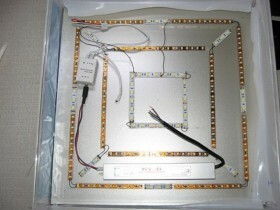 LED chandelier with remote control are common, there will need to detect breakage, exact circuit controller chandeliers. 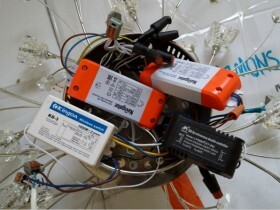 chandelier control unit typically hermetically sealed to the shell, and on it is drawn circuit manufacturers. 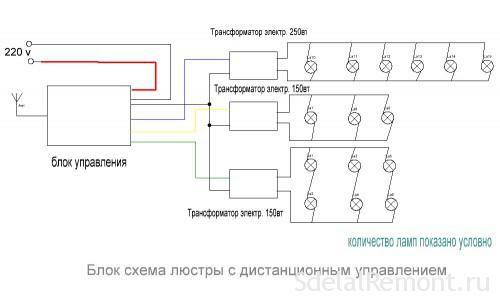 Only this circuit wiring and lighting elements. There are also collapsible casing blocks, then the simplified version. If not collapsible rang block with a tester output to lighting elements (LEDs). In the absence of energization can be a reason to break the signal receiver. intelligible ego, check visually contacts and a track on the board, breakage of parts. If the supply voltage goes to a lighting branch, It means failure in the control unit, and not in the receiver signal. Burned part can vypayat and ping, to start all resistance (watch scheme), putting on the device icon OMA. Then, the capacitor capacitance, the benefit to them have designations, polarity and the species is also important when checking. 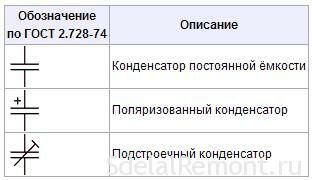 Upon detection of discrepancies in the nominal, solder all over again. chandelier control unit controls the intensity of combustion modes and LED elements. Violation of a chain (lamp embodiment in plafones), not incapacitate unit, possibly, blown fuse. But still, check units, whether they melted places, there is, replace it with a new. Incorrect connection wires are burning only parts in the power supply. Block regulator is protected against excessive loads. It can ping scheme. Many models of regulators, drivers and LED lighting power supply units come with a cooling radiator. They made seat, through which the chip or other control element gives warmth. On most tubes radiators are present. The absence of a special lubricant, thermal paste, Most causes of overheating (to 15%) boards and blocks. Unscrew and check, whether it is applied on the seat plane. Thermopaste applied in a thin layer over the entire surface of the seat, a large number will only worsen the heat transfer. Additional screwing of thin plate of aluminum radiator, increase the heat transfer can be, while installation is carried out, without blocking the main air flow passing through it. As usual we do not see anything in the maintenance LED ceiling chandelier, not. Most do it is not so difficult. We need a little patience, a little bit of practice and a tin droplet knowledge. Of course a variety of lamps, lamps and chandeliers of all kinds, It does not make us miss in the process of repair. But this amount of detail, It helps us understand, precise circuit LED lamps and of course a great desire. Not necessarily to buy a new LED, just fix it, Throw small jumper between terminals. Be sure to remove the remnants of the burnt LEDs, strip the cost of a deposit, it conducts electricity.